Since ancient times, The Olympic Games have represented a meeting between sports and art. We uncover the story behind the forgotten art competitions of the modern Olympic Games. When they Olympics Games were founded in ancient Greece they were a religious ceremony instated to commemorate the gods' and man's contest-oriented soul. The first contests in gymnastics and riding were then followed by poetry and other artistic pastime. Through the legacy of Greek art, sculpture and ceramics, we can reimagine how the Olympic Games were held. 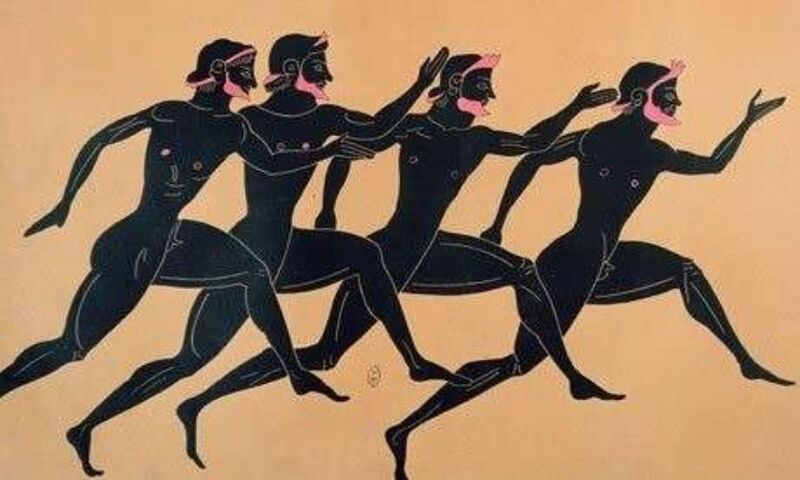 Athletes in ancient Greece who won their sport in the Olympic Games received no medals. Instead, the competitions were held to honor Zeus in the city of Olympia. Instead, they noted the names of the winners, their fathers name, place of birth and lineage and registered them as champions. When the winners returned to their hometowns, they were so well received that poets and speakers told others of their achievements for decades and treated them as deities. 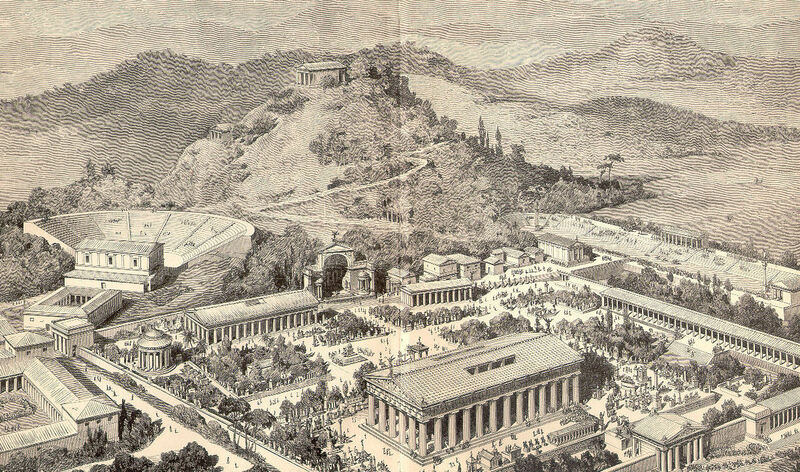 Drawing of Ancient Olympia, from Pierers Universal Dictionary (1891). Champions were presented an olive branch and wool band to wear on their head as well as free food for their entire life. If a sportsman succeeded in winning five branches in a Pentathlon a statue was erected in his honor in the temple in Olympia, Zeus' main sanctuary. The first ancient Olympic Games took place in 776 BC and were held every four years through to the year 393 AD. The Olympics games were given a second life when Baron de Coubertin (Pierre Frèdy) founded the Comité International Olympique (IOC) in 1894. In the first committee, 12 countries were represented: Argentina, Austria, Belgium, USA, France, Great Britain, Greece, Hungary, Italy, New Zealand , Russia and Sweden. The first modern Olympics was held in Athens in 1896 and the first Winter Games took place in 1924 when a winter week in Chamonix, France, was planned for the purpose of developing the Olympic Games to include more sports. 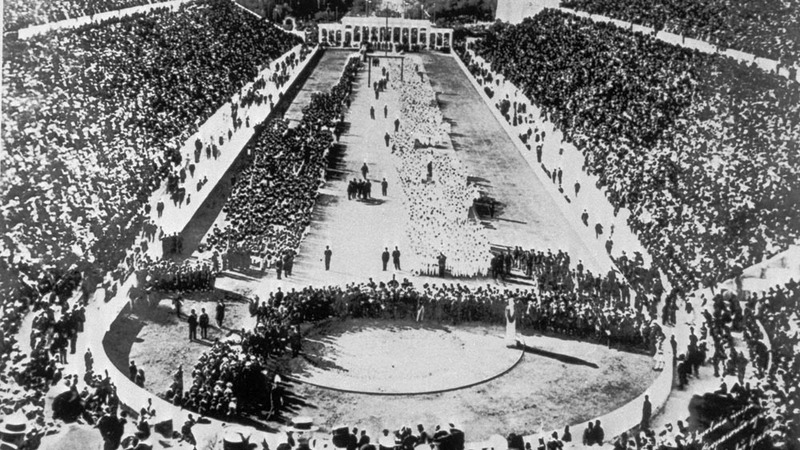 Contests in art had been held in ancient Greece and were included in the modern Olympics in the early 20th century. 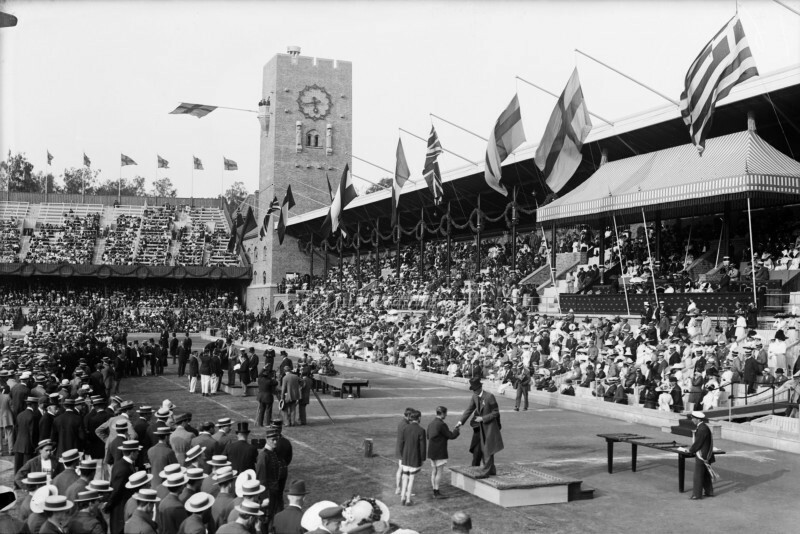 From the 1912 games in Stockholm until the 1948 games in London, contests in art were held, something that came from Coubertin's original idea. These competitions were called the Pentathlon of the Muses. Coubertin wanted to include these art competitions in honor of the Olympic Games of ancient Greece. Medals could be won for architecture, literature, music, painting and sculpture. All entries in the arts competitions had to be sports-themed. However, many artists disputed the idea of winning medals for their work, claiming they did not want to compete, with worries of how fair an assessment the competitions would be. On the other hand, some artists saw the competitions as a fantastic platform to achieve international recognition. 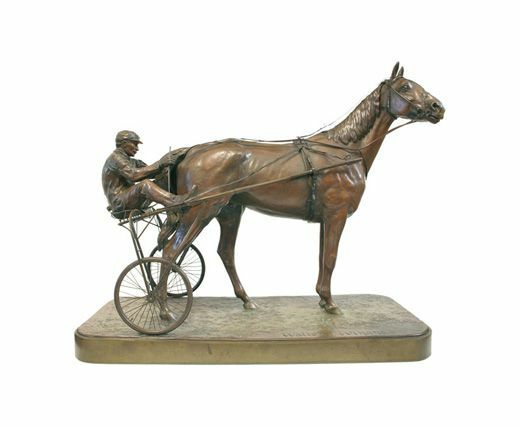 At the 1912 games held in Stockholm, American Walter Winans took gold for his bronze cast of a horse pulling a chariot, entitled An American Trotter. It was the first gold ever awarded in the modern Olympic Games for sculpture. In 1908, Winans had won a silver for sharpshooting in the London Games, as well as a silver for the same sport the following year. In Stockholm 1912, five gold medals were awarded and the first gold medal in literature went to founder Coubertin for his contribution Ode to the Sport, which he submitted under a pseudonym. A total of 146 medals have been awarded for the arts between 1912 to 1948, 11 of which were women medalists. In the 1932 games held in L.A., the USA won 7 medals for the Olympic art competitions. This was the most the US representatives had ever won for arts in one games. During the 1932 Games, it is recorded that nearly 400 000 visitors came to the Los Angeles Museum of History, Science and Art to see works that had been entered by big names for the competitions. For architecture, John Russell Pope, the architect of the Jefferson Memorial, took silver for his design for the Payne Whitney Gymnasium at Yale University. In the same games, artist Lee Blair took a gold for drawings, whilst Percy Crosby was awarded a silver for the same competition. For his graphic work entitled Leg Scissors, Joseph Golinkin took home the gold for the United States. 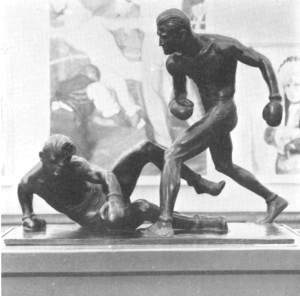 Sculptor Mahonri Young was awarded the gold for Team USA for his statue The Knockdown. Finally, after much debate, the 1948 Games were the last to include the art competitions. This segment was replaced by an exhibition that had no competitive element, known as the Cultural Olympiad. All medals awarded for the art competitions were stricken from the Olympic record, though and do not count toward a country's current medal count. Search for sports and Olympic memorabilia on Barnebys here.